باتولیت الوند در جنوب شهرستان همدان و بخش شمالی زون دگرگونی سنندج- سیرجان واقع شده است. گرانیت پورفیروییدی، کوارتزدیوریت و دیوریت، واحد­­های سنگی گرانیتوییدهای مزوکرات الوند را تشکیل می‌دهند. گرانیت­ پورفیروییدی دانه‎درشت حجم اصلی باتولیت الوند را تشکیل می­دهد. برای بررسی شیمی کانی و ترموبارومتری گرانیتویید­های مزوکرات الوند آنالیز نقطه­ای بر روی کانی­های ارتوکلاز، پلاژیوکلاز و بیوتیت موجود در گرانیت­های پرفیروییدی و بر روی کانی­های آمفیبول، پلاژیوکلاز و بیوتیت در کوارتزدیوریت­ها و دیوریت‎ها انجام پذیرفت. مطالعه شیمی کانی­ها نشان می­دهد که آمفیبول‌های موجود در کوارتزدیوریت‌ها بیشتر از نوع مگنزیوهورنبلند و در دیوریت‌ها از نوع مگنزیوهورنبلند و چرماکیت هستند. پلاژیوکلازهای موجود درگرانیت­های پورفیروییدی از نوع آلبیت و الیگوکلاز، در کوارتزدیوریت­ها از نوع الیگوکلاز و در دیوریت­ها از نوع آندزین هستند. بیوتیت­های تشکیل‌دهنده این سنگ­ها اولیه هستند و در محدوده آنیت قرار می­گیرند. نتایج حاصل از مطالعه ترموبارومتری آمفیبول­ها نشان می­دهد که میانگین دمای تشکیل آمفیبول­های موجود در گرانیتویید­های مزوکرات باتولیت الوند 787 ~ درجه سانتی‌گراد و فشار تشکیل آنها 46/1 ~کیلوبار است. نتایج حاصل از ترموبارومتری نشان می­دهد که بیوتیت­های موجود در گرانیت‎های پورفیروییدی مزوکرات باتولیت الوند 679 ~ درجه سانتی‌گراد و فشار تشکیل آنها 56/1 ~کیلوبار است. عمق تشکیل گرانیتویید­های مزوکرات الوند با توجه به فشار تشکیل آنها (5/1~ کیلوبار) 7/4~ کیلومتری از سطح زمین است. The Alvand batholith is located in the south of the Hamedan city and in the northern part of the Sanandaj-Sirjan metamorphic zone. Porphyroid granite, quartz diorite and diorite are formed rock members of the mesocratic granitoids in the Alvand plutonic complex. Porphyroid coarse-grained granites make up the main volume of the Alvand bathilith. For study of minerals chemistry and thermobarometry of the mesocratic granitoids of the Alvand bathilith, microprobe analyses were carried out on the orthoclase, plagioclase and biotite in the porphyroid granites and were carried out on the amphibole, plagioclase and biotite in the quartz diorites and diorite. Mineral chemistry study shows that amphiboles in the quartz diorites are often of the magnesio-hornblende type and in the diorite are magnesio-hornblende and tschermakite type. Plagioclases in the porphyroid granite are albite and oligoclas type, in the quartz diorites are oligoclas and in the diorite are andesine type. Biotites in the mesocratic granitoids of these rocks are primary type and they are filled in the annite area. Results of thermobarometric study show that average of P-T conditions of amphibole crystallization in the mesocratic granitoids of the Alvand batholith are ~787 oC and ~1.46 Kb. Results of biotite thermobarometric study estimate that average of temperature and pressure of biotite solidification in mesocratic granitoids of the Alvand batholith are ~ 679 oC and 1.56 Kb. According to the pressure formation (~1.5 Kb) of the Alvand batholith, depth of its emplacement is estimated ~ 4.7 Km. اقلیمی، ب.، 1379- نقشه زمین‌شناسی، مقیاس 1:100000 همدان و گزارش حاشیه آن، سازمان زمین‌شناسی و اکتشافات معدنی کشور. ایرانی ، م.، 1372- بررسی پترولوژی توده گرانیتی الوند و هاله دگرگونی آن، پایان‎نامه کارشناسی ارشد، دانشکده علوم زمین، دانشگاه شهید بهشتی، (گرایش پترولوژی)، 221 ص. زرعیان، س.، فرقانی، ع.، فیاض، ه.، 1350- توده گرانیتی الوند و هاله دگرگونی آن، نشریه دانشکده علوم دانشگاه تهران، جلد سوم، شماره 4، صص. 37 تا 47. سپاهی گرو، ع. ا.، 1378- پترولوژی مجموعه پلوتونیک الوند با نگرش ویژه بر گرانیتوییدها، پایان‌نامه دکتری (پترولوژی)، دانشکده علوم، گروه زمین‌شناسی، دانشگاه تربیت معلم تهران، 322 ص. سپاهی، ع. ا.، برزویی، ک. و سلامی، ص.، 1391- مطالعه شیمی کانی، دما- فشارسنجی و جایگاه تکتونیکی سنگ‌های نفوذی منطقه سرابی تویسرکان (استان همدان)، مجله پترولوژی، سال 3، شماره 11، صص. 39 تا 58. صادقیان، م.، 1373- بررسی پترولوژی سنگ‌های آذرین و دگرگونی منطقه چشمه قصابان همدان، پایان‌نامه کارشناسی ارشد (پترولوژی)، دانشگاه تهران، دانشکده علوم، گروه زمین‌شناسی، 267 ص. ولی‎زاده، م.، 1353- بررسی سنگ‌شناسی و شیمی- کانی شناسی کمپلکس الوند (همدان)، نشریه دانشکده علوم دانشگاه تهران، جلد 6، شماره 1، صص. 14 تا 29. Abdel-Rahman, A., 1994- Nature of Biotite from Alkaline,Calc-alkaline, and Peraluminous Magmas. Journal of Petrology, 35: 525–541. Anderson, J. L. and Smith D. R., 1995- The effects of temperature and fO2 on the Al-in hornblende barometer. American Mineralogist 80: 549-559. Anderson, J. L., 1996- Status of thermobarometry in granitic batholiths. Trans R Soc Edinb 87: 125–138. Berberian, M. and King, G. C. P., 1982- Towards a paleogeography and tectonic evolution of Iran. Can. J. Earth Sci. 18: 210 – 265. Blundy, J. D. and Holland, T. J. B., 1990- Calcic amphibole equilibria and a new mphibole-plagioclas geothermometer. Contributions to Mineralogy and Petrology 104: 208-224. Deer, W. A., Howie, A. and Sussman, J., 1986- An interdiction to rock- forming Minerals. 17th edition, Longman Ltd, UK, 528p. Eshraghi, S. A. and Mohammadi Gharai, M., 2003- Geological Map of Tuyserkan 1/100000, Geological Survey and Mineral exploration of Iran, Tehran. Ghalamghash, J., Mirnejad, H. and Rashid, H., 2009- Mixing and mingling of mafic and felsic magmas along the Neo-Tethys continental margin, Sanandaj-Sirjan zone, NW Iran: A case study from the Alvand pluton. Journal of mineralogy and geochemistry 15: 79-83. Ghent, E. D., Nicholls, J., Simony, P. S., Sevigny, J. H. and Stout, M. Z., 1991- Hornblende barometry of the Nelson batholith, southeastern British Columbia: Tectonic implications. Canadian Journal of Earth Science 28: 1982-1991. Hammarstrom, J. M. and Zen, E., 1986- Aluminum in hornblende: An empirical igneous geobarometer. American Mineralogist 71: 1297-1313. Henry, D. J., Guidotti, C. V. and Thomson, J. A., 2005- The Ti-saturation surface for low-to-medium pressure metapelitic biotites: Implications for geothermometry and Ti-substitution mechanisms. American Mineralogist 90: 316.328. Holland, T. J. B. and Blundy, J. D., 1994- Non-ideal interactions in calcic amphiboles and their bearing on amphibole-plagioclase thermometry. Contrib Mineral Petrol 116: 433–447. Hollister, L. S., Grissom, G. C., Peters, E. K., Stowell, H. H. and Sisson, V. B., 1987- Confirmation of the empirical correlation of Al in hornblende with pressure of solidification of calc-alkaline plutons. American Mineralogist 72: 231–239. Johnson, M. C. and Rutherfurd, M. J., 1989- Experimental calibration of the aluminum-in-hornblende geobarometer with application to Long Valley caldera (California) volcanic rocks. Geology 17: 837-841. Lalonde, A. E. and Bernard, P., 1993- Composition and color of biotite from granites: two useful properies in the characterization of plutonic suites from the Hepburn internal zone of Wopmay orogen, Northwest Territories. Canadian Mineralogist 31: 203–217. Leake, B. E., Wooliey A. R., Arps, Ch. E. S., Birch, W. D., Gilbert, M. Ch., Grice, J. D., Hawthorne, F. C., Kato, A., Kisch, H. J., Krivovichev, V. G., Linthout, K., Laird, J., Mandarino, J. A., Maresch, W. V., Nickel, E. H., Rock, N., M. S., Schumacher, J. C., Smith, D. C., Stephenson, N. C. N., Ungaretti, L., Whittaker, E. J. W. and Youzhi, G., 1997- Nomenclature of amphiboles: Report of the subcommittee on amphiboles of the International Mineralogical Association Commission on New Mineral Names. Canadian Mineralogist 35: 219–46. Mogessie, A., Ettinger, K., Leake, B. E. and Tessadri, K., 2001- A hypercard program to determine the name of an amphibole from electron microprobe and wet chemical analyses, Computers & Geosciences 27:1169–1178. Nachit, H., Ibhi, A., Abia, E. H. and Ben Ohoud, M., 2005- Discrimination between Primary magmatic biotites, reequilibrated biotites and neoformed biotites. Comptes Rendus Geoscience 337: 1415-1420. Naney, M. T. and Swanson, S., 1980- The effect of Fe an Mg on crystallization in granitic systems. American Mineralogist, 65: 639-653. Naney, M. T., 1983- Phase equilibria of rock-forming ferromagnesian silicates in granitic systems. American journal of science, 283: 993-1033. Partin, E., Hewitt, D. A. and Wones, D. R., 1983- Quantification of ferric iron in biotite. Geological Society American 15, 659. Putirka, K., 2016- Amphibole thermometers and barometers for igneous systems and barometers for igneous systems and some implications for eruption mechanisms of felsic magmas at arc volcanoes. American Mineralogist 101: 841–858. Ricou, L. E., Braud, J. and Brunn, J. A., 1977- Le Zagros Memoire Societe Geologique de France. Hors-Serie 8: 33–52. Ridolfi, F., Renzulli. A. and Puerini, M., 2010- Stability and chemical equilibrium of amphibole in calc-alkaline magmas: an overview, new thermobarometric formulations and application to subduction-related volcanoes. Contr Mineral Petrol 160: 45–66. Schmidt, M. W., 1992- Amphibole composition in tonalite as a function of pressure: An experimental calibration of the AI-in-hornblende barometer. Contributions to Mineralogy and Petrology 110: 304–310. 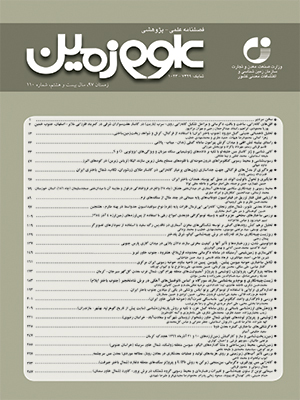 Shahbazi, H., Siebel, W., Pourmoafee, M., Ghorbani, M., Sepahi, A. A., Shang, C. K. and Vousoughi Abedini, M., 2010- Geochemistry and U-Pb zircon geochronology of the Alvand plutonic complex in Sanandaj-Sirjan Zone (Iran), New evidence for Jurassic magmatism. Journal of Asian Earth Sciences 39: 668–683. Uchida, E., Endo, Sh. and Makino, M., 2007- Relationship between solidification depth of granitic rocks and formation of hydrothermal ore deposits. Resource Geology 57: 47–56. Vyhnal, C. R., McSween, H. Y. Jr. and Alexander, J. S., 1991- Hornblende chemistry in southern Appalachian granitoids Implications for aluminum hornblende thermobarometry and magmatic epidote stability. American Mineralogist: 76, 176-188. Wones, D. R., 1989- Significance of the assemblage titanite+magnetite +quartz in granitic rocks. American Mineralogist 74: 744– 749.